Derived from the Greek word ‘kryos’, meaning frost, Cryo Hops utilizes industry-leading, cryogenic hop-processing technology to produce two innovative hop products. Whole hop cones are separated into concentrated lupulin and bract at extremely low temperatures in a nitrogen-rich atmosphere, preserving each component of the hop and avoiding opportunities for oxidation. Cryo Hops are the concentrated lupulin of whole-leaf hops containing resins and aromatic oils. They are designed to provide intense hop flavor and aroma, enabling brewers to dose large quantities of hops without introducing astringent flavors or vegetative material. To ensure preservation of the essential oils and resins, the production process is conducted at cool temperatures, approximately 30 degrees lower than regular hop pellet production. KETTLE: Late additions only; early kettle additions should be avoided to prevent boiling out the intense aroma characteristics. WHIRLPOOL: Whirlpool additions are an excellent way to increase aroma and reduce trub-load from large, late additions. KNOCKOUT OR HOPBACK: Due to fine particle size, there is low risk of clogging heat exchangers. This allows for extremely late additions, even with carryover into the fermenter. FERMENTER: Use in the fermenter is an excellent way to increase aroma while reducing trub-loss. LupuLN2 will settle out during normal conditioning and can be fined, filtered or centrifuged as normal. RECIPE ADAPTATION: Regardless of application, early trials indicate LupuLN2 beers showcase pronounced juicy and resinous flavors with reduced grassy characteristics. As a result, some brewers recommend using LupuLN2 in conjunction with T90 (regular) pellets to ensure the complexity and flavors of the whole hop cone are retained. 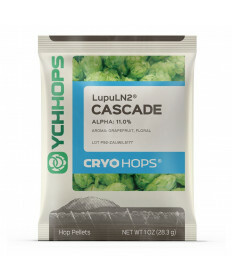 Creating new recipes with LupuLN2 is an excellent (and safe) way to showcase hops in innovative beers and styles. As a starting point for recipe formulation or modification, the estimated dosing rate of LupuLN2 is 40-50% of hop pellets by weight.